Courchevel is an area with ski resorts in the Alps of France. The Courchevel Altiport (LFLJ) (altiport is the French term of mountain airfield) is famous for its sloping runway with a slope up to 19%. The runway is 1760 ft long and there is a difference in elevation of 210 feet between both thresholds. With an elevation of ~6500 ft the airport is also known as an altiport. Read this article about an approach and departure from the airport. I don't know of present scheduled flights to Courchevel. However, the former Tyrolean Airways (now Austrian Arrows) used make flights to the airport in the Dash 7 . The airline had it's base in Innsbruck, Austria (LOWI), another famous airport in the alps. Make a ~1 hour flight in the Dash 7 from Innsbruck to Courchevel crossing a great part of the Alps. For a shorter flight depart from Saint Exupery Airport (LFLL) in Lyon, the capital of the region. All approaches are visual, landings on rwy 22 only and takeoffs rwy 4 only. Download airport and approach charts here. Try a small single engine piston aircraft, e.g. the Cessna 172, where you'll experience how difficult it is to operate a small aircraft at high altitude and when landing uphill. 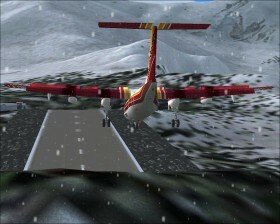 For maximum challenge try the Dash 7 aircraft as formerly used by Tyrolean Airways at Courchevel. The 4 engine turboprop aircraft is a STOL aircraft (short takeoff and landing) and therefore suitable for the short runway though it is very challenging. Use the great freeware Dash 7 Project aircraft developed for FS2004 by Milton Shupe which comes in Tyrolean Airways livery.